Looking for the perfect dessert for your menu? Try our Spiced Mini Cupcakes made with Campbell's® Healthy Request® Condensed Tomato Soup. This spicy and savory treat is the perfect way to finish off any meal! 1. Mix flour, baking powder, baking soda, nutmeg, cinnamon, and cloves. Reserve. 3. Gradually add sugar. Beat 5 minutes more, or until light and fluffy. Scrape sides of bowl frequently. 5. 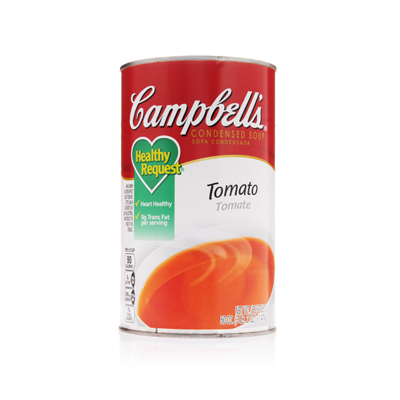 Add Campbell's® Healthy Request® Condensed Tomato Soup and flour mixture alternately, mixing until smooth. 7. Bake at 350° F for 35 minutes, or until cake tester wipes clean. Remove from oven. Cool. 8. When cooled, using a #30 scoop, top each cupcake with about 2 tablespoons whipped topping. Serve immediately.